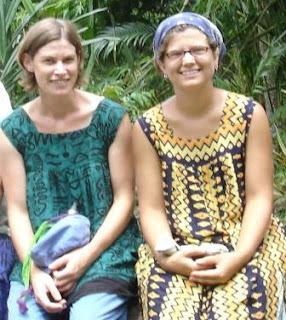 I can’t remember if I’ve explained these yet, so if not…the long tops that Liz and I wore much of our time in the village are called “meri blouses” (meri = “woman” in Tok Pisin) – they’re all that not that attractive to Western eyes, but they are quite comfortable. Meri blouses are the traditional tops/dresses in PNG. They are generally quite roomy, falling anywhere from mid-thigh (blouse length) to mid-calf (dress length). In PNG culture, it is important for women to wear clothes which are baggy in the thigh area. I also often wore coulottes--making myself doubly-baggy. I think they're cute! You look great, Lisa. I'm so happy to have this way to peek into your life. Thanks for the updates!